After their martyrdom in Rome along the Via Salaria, Saints Chrysanthos and Daria were buried in the nearby Catacomba di Trasone. 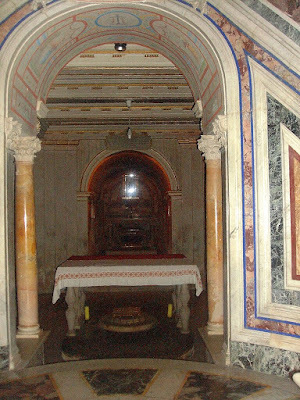 When the catacombs were abandoned in the ninth century, the relics of the two Saints were originally taken to Santi Apostoli. They are now claimed to be enshrined in several locations, most notably at the Cathedral of Reggio Emilia where a 2011 analysis found the human remains of an age and makeup corresponding to the documented origins. 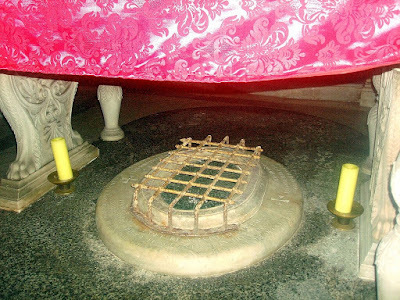 Below is the location of where the relics of the Saints rest in the Church of Santi Apostoli (Holy Apostles) in Rome. 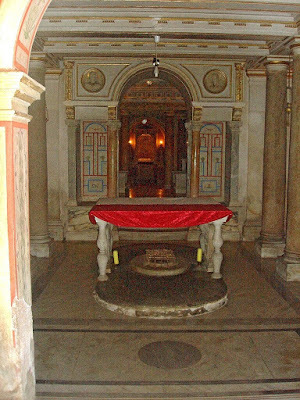 They are said to be buried with Saints Diodoros the Presbyter and Marianos the Deacon, under the altar of the lower ancient basilica.